What Facts Should I Know about Stroke-Related Dementia? What Are the Symptoms of Stroke-Related Dementia? When Should I Call the Doctor about Stroke-Related Dementia? What Are the Exams and Tests to diagnose Stroke-Related Dementia? What Is the Treatment for Stroke-Related Dementia? Are there Home Remedies for Stroke-Related Dementia? What Is the Medical Treatment for Stroke-Related Dementia? What Are the Medications for Stroke-Related Dementia? Is there Surgery for Stroke-Related Dementia? What Is the Follow-up for Stroke-Related Dementia? How Can I Prevent Stroke-Related Dementia? What Is the Outlook for Stroke-Related Dementia? Are there Support Groups and Counseling for Stroke-Related Dementia? What is the medical definition of a stroke? 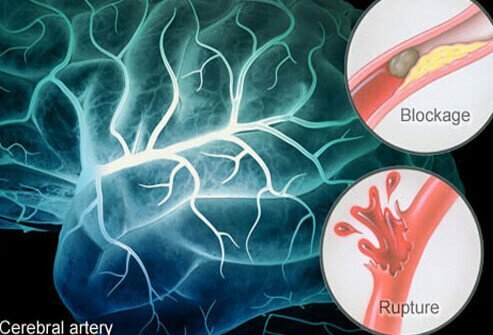 Stroke (“brain attack”) is a disease of the blood vessels in and around the brain. It occurs when part of the brain does not receive enough blood to function normally and the cells die (infarction), or when a blood vessel ruptures (hemorrhagic stroke). Infarction is more common than hemorrhage and has a number of causes; for example, a vessel (artery) supplying blood to the brain can become blocked by a fatty deposit (plaque), which can form clots and send pieces into vessels further in the brain, or these arteries become thickened or hardened, narrowing the space where the blood flows (atherosclerosis). In addition, clots can arise in the heart and travel to the brain. Permanent damage to brain cells can result. Does a stroke lead to dementia? The symptoms of stroke vary, depending on which part of the brain is affected. Common symptoms of stroke are sudden paralysis or loss of sensation in part of the body (especially on one side), partial loss of vision or double vision, or loss of balance. Loss of bladder and bowel control can also occur. Other symptoms include decline in “cognitive” mental functions such as memory, speech and language, thinking, organization, reasoning, or judgment. Changes in behavior and personality may occur. If these symptoms are severe enough to interfere with everyday activities, they are called dementia. Cognitive decline related to stroke is usually called vascular dementia or vascular cognitive impairment to distinguish it from other types of dementia. In the United States, it is the second most common form of dementia after Alzheimer's Disease. Vascular dementia is preventable, but only if the underlying vascular disease is recognized and treated early. People who have had a stroke have a greater risk of dementia than people who have not had a stroke. About 1 in 10 people who have a stroke develop signs of dementia within 1 year. Vascular dementia is most common in older people, who are more likely than younger people to have vascular diseases. It is more common in men than in women. Vascular dementia is not a single disease but a group of conditions relating to different vascular problems. What all the conditions have in common is that a critical part of the brain does not receive enough oxygen. The vascular damage underlying stroke-related dementia occurs in several different patterns. The major cause of the vascular lesions underlying stroke-related dementia is untreated high blood pressure (hypertension). Diabetes, atherosclerosis (“hardening of the arteries”), heart disease, high cholesterol, peripheral vascular disease, and smoking are other risk factors. Other causes include uncommon vascular diseases. Vascular dementia may occur with Alzheimer's Disease. ApoE4 is a protein whose main role is to help transport cholesterol in the blood. A high level of this protein in the blood poses a significant risk factor for Alzheimer dementia and has been linked to vascular dementia. Cognitive symptoms may appear abruptly, over weeks or months in a stepwise manner, or even gradually over years. The appearance of symptoms varies by the type of stroke and the part of the brain affected. Cognitive decline usually occurs within 3 months of a recognized stroke and may indicate vascular dementia. Some slowing of thinking processes is normal in aging. However, any change in thinking, memory, reasoning, attention, grooming, behavior, or personality that interferes with your ability to care for yourself, maintain health and safety, or participate in activities that you enjoy warrants a visit to your health care provider. An early diagnosis allows treatment to begin earlier in the disease, when it has the best chance of offering significant symptom relief. Early diagnosis also allows you to plan activities and to arrange for care while you can still take part in making decisions. Many different conditions can cause dementia symptoms. Your health care provider has the difficult task of finding the cause of your symptoms. This is very important, because some causes of dementia are reversible with treatment while others are not. The process of narrowing down the possibilities to reach your diagnosis is complicated. Your health care provider will gather information from several different sources. At any time in the process, he or she may consult an expert in dementia (geriatrician, neurologist, psychiatrist). The first step in the evaluation is the medical interview. You will be asked questions about your symptoms and when they appeared, about medical problems now and in the past, about medications you have taken now and in the past, about family medical problems, and about your habits and lifestyle. A physical examination will look for physical disabilities and signs of underlying conditions, such as high blood pressure, heart and blood vessel disease, and previous strokes. It will also include a mental status examination. This involves following simple directions and answering questions that check orientation, attention, language, and memory. Neuropsychological testing may be done to identify the extent of dementia. Neuropsychological testing is a detailed cognitive assessment that helps to pinpoint and document a person's cognitive problems and strengths. Results vary with the site and severity of vascular disease in the brain. This testing can help find subtle or early cognitive deficits and give a more accurate diagnosis of the problems, thus assisting in treatment planning. The testing involves answering questions and performing tasks that have been carefully prepared for this purpose. It is carried out by a psychologist or other specially trained professional. It assesses the individual's appearance, mood, anxiety level, and experience of delusions or hallucinations. It assesses cognitive abilities such as memory for words and visual patterns, attention, orientation to time and place, use of language, and ability to carry out various tasks and follow instructions. Reasoning, abstract thinking, and problem solving are also tested. These include blood tests to rule out infections, blood disorders, chemical abnormalities, hormonal disorders, and liver or kidney problems that could cause or mimic dementia symptoms. Lab tests can also pinpoint conditions such as diabetes and certain vascular disorders that could underlie dementia. Brain scans are very helpful in detecting stroke. They can also rule out certain other conditions that cause dementia. MRI or CT scan of the brain usually shows signs that indicate stroke or vascular disease, including bleeding. Positron-emission tomography (PET) or single-photon emission computed tomography (SPECT) scan may be helpful in distinguishing vascular dementia from Alzheimer's Disease. These scans are available only at some large medical centers. Other tests may be done to look for conditions that commonly cause stroke and vascular disease. Lumbar puncture (spinal tap) - under sterile conditions, fluid is removed by placing a needle into the spinal canal. The patient is given a local anesthetic prior to the removal. The fluid is sent for special tests after the opening pressure is measured. This may be done depending on the symptoms that the patient presents to the physician. Tests may also be done to rule out other causes of dementia. Treatments available now cannot reverse the brain damage caused by a stroke once the injury is more than a few hours old. The goals of treatment are preventing new strokes by enhancing vascular health, slowing the progression of cognitive decline, and treating the symptoms related to it. Treatments include medication, behavioral interventions, and surgery. A person with vascular dementia should be under medical care. There are steps you can take, however, to reduce your risk of further vascular damage or stroke. The most important thing you can do is adopt healthy habits. You should maintain a healthy weight, eat a balanced and healthy diet, exercise regularly, and not smoke. You must develop a realistic attitude toward your limitations. You may require assistance with some everyday tasks, such as managing your finances. You may have to give up some of your independence (for example, driving a car). Your safety, and the safety of others, depends on it. Many people with vascular dementia are eventually unable to live independently and care for themselves. Often, family members become responsible for their care. Your health care provider can discuss with you and your family how you should plan for future care. Caregiving is best when it is structured, respectful, and friendly. This type of caregiving is the best way to approach the person's behavioral problems. Your health care provider can give you advice on how to best care for your loved one and how to react to troubling behaviors and symptoms. Use short, simple sentences when communicating with the person with dementia. Simplify and create a routine for all self-care tasks such as bathing and dressing. Establish a daily routine for all activities such as meals, medication administration, recreation, exercise, and sleep. Use signs and pictures, clocks and calendars, family photos, and a list of daily activities to reorient the person when he or she gets confused. Use distraction, not confrontation, to control irritable or socially inappropriate behaviors. If the affected person is unable to cope in the community, the caregiver should initiate discussion about long-term care planning, including nursing home placement. Your health care provider can discuss issues regarding caregiver stress and respite care. Respite care is a community resource that gives the caregiver relief for a short time. Day programs can provide relief for families, particularly working families, and they provide structure and activities for the person with dementia. Drug therapies in vascular dementia include those that prevent clotting and treat underlying vascular risk factors (for example, high blood pressure and diabetes) to prevent further progression of dementia. Drug therapies may also treat associated symptoms like depression. Antiplatelet agents: These are medications that inhibit blood clotting by altering platelet function and aggregation. Platelet inhibition is a mild form of blood thinning. These agents help prevent recurrent stroke. Antihypertensive agents: These drugs reduce blood pressure and thus help prevent strokes. Other agents may be given to treat additional risk factors for stroke (for example, high cholesterol, heart disease, and diabetes). Antidepressant agents: Severe depression is a very common mood disorder in vascular dementia and may contribute to cognitive decline. Treating the depression with medication may not only relieve the depression but also improve mental functioning. If you take medications for other medical conditions, your health care provider may adjust or change these medications. Some drugs can worsen dementia symptoms. Symptoms such as social inappropriateness and aggression may improve with various behavior-changing interventions. Some interventions focus on helping the individual adjust or control his or her behavior. Others focus on helping caregivers and other family members change the person's behavior. These approaches sometimes work better when combined with drug treatment. The goal of surgery is to improve the flow of blood in the blood vessels of the brain. An example is carotid endarterectomy, an operation to remove a blockage from a carotid artery, one of a pair that comprises the main arteries leading to the brain. Not everyone is a candidate for these operations. If you have had a stroke or have vascular dementia, you should see your health care provider regularly. These visits allow him or her to evaluate your symptoms and adjust treatments if necessary. You may eventually become unable to care for yourself, or even to make decisions about your care. It is best to discuss future care arrangements with family members as early as possible, so that your wishes can be clarified and documented for the future. Your health care provider can advise you about legal documents that you should complete to ensure that these wishes are observed. In many cases, vascular dementia is preventable. Risk factors for stroke and vascular dementia include high blood pressure, high cholesterol, heart disease, smoking, and diabetes. For many people, risk can be reduced by adopting a healthy lifestyle. People who have had a stroke may be able to reduce their risk of further strokes by drug treatment or surgery in addition to adopting a healthy lifestyle. At this time, there is no known cure for vascular dementia. While treatment can stop or slow the worsening of symptoms, or even improve them in some cases, the damage done to the brain by a stroke cannot be reversed. As dementia progresses, behavior problems usually become more severe. Troubling behaviors like agitation, aggression, wandering, sleep disorders, and inappropriate sexual behavior may become unmanageable. The physical demands of caregiving, such as bathing, dressing, grooming, feeding, and assisting with using the toilet, may become overwhelming for family members. Under these conditions, the family may decide to place the person in a nursing home or similar facility. Vascular dementia appears to shorten life expectancy. The most common causes of death are complications of dementia and cardiovascular disease. If you have vascular dementia, you know how difficult this can be. It affects every aspect of your life, including family relationships, work, financial status, social life, and physical and mental health. You feel the frustration of being disabled and dependent. You may feel angry, resentful, or hopeless. Caregivers have similar feelings of frustration. If you are a caregiver, you may feel unable to cope with the demands of caring for a dependent, difficult relative. Besides the sadness of seeing the effects of your loved one's disease, you may feel overwhelmed, resentful, and angry. These feelings may in turn leave you feeling guilty, ashamed, and anxious. Depression is not uncommon, but it usually gets better with treatment. Caregivers have different thresholds for tolerating these challenges. For many caregivers, just “venting” or talking about the frustrations of caregiving can be enormously helpful. Others need more, but may feel uneasy about asking for the help they need. One thing is certain, though: if you, as a caregiver, are given no relief, you can burn out, develop your own mental and physical problems, and become unable to care for the person with dementia. This is why support groups were created. Support groups are groups of people who have lived through the same difficult experiences and want to help themselves and others by sharing coping strategies. Mental health professionals strongly recommend that family caregivers take part in support groups. Support groups serve a number of different purposes for a person living with the extreme stress of being a caregiver for a person with vascular dementia. The group allows the person to express his or her true feelings in an accepting, nonjudgmental atmosphere. The group's shared experiences allow the caregiver to feel less alone and isolated. The group can offer fresh ideas for coping with specific problems. The group can introduce the caregiver to resources that may be able to provide some relief. The group can give the caregiver the strength he or she needs to ask for help. Support groups meet in person, on the telephone, or on the Internet. To find a support group that works for you, contact the following organizations. You can ask your health care provider, or go on the Internet. If you do not have access to the Internet, go to the public library. "Etiology, clinical manifestations, and diagnosis of vascular dementia"
Was your loved one a victim of stroke-related dementia? Please describe your experience. What kind of medical treatment did your loved one receive in response to stroke-related dementia?